Apple has officially announced its new magical, revolutionary device for surfing the web, reading and sending email, viewing photos, watching movies or videos, listening to music, playing games, reading e-books and so forth, which named as Apple iPad (previously rumored as Apple iTablet or Apple iSlate). Apple iPad is able to run virtually all of the 140,000 apps from the App Store – from games to productivity apps and much more, featuring 12 next-generation, innovative multi-touch applications that work in both portrait and landscape. 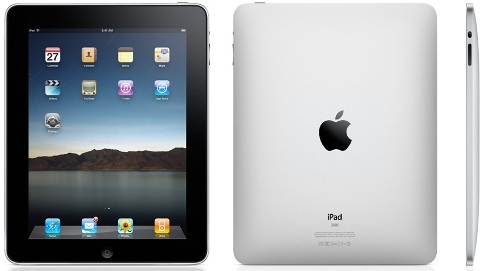 The iPad is available in 2 versions – Wi-Fi and Wi-Fi + 3G models. In addition, Apple also announced a new version of iWork desktop-class productivity suite for the iPad, which includes Pages, Keynote and Numbers apps that have been completely redesigned for Apple iPad, allowing users to create incredible presentations with animations and transitions, word processing documents, and spreadsheets with charts, functions and formulas by directly touching the words and images on the Multi-Touch display. iWork will costs $9.99. Complete list of features and specifications can be found on Apple website. Furthermore, the company also introduced a great and convenient way to browse, buy and read books on Apple iPad – iBooks app, which includes Apple’s new iBookstore that features books from major and independent publishers. There are various iPad accessories that will be launched by Apple together with iPad. And, check out iPad video demo and keynote address VOD. The new Apple iPad which measures 9.56 x 7.47 x 0.5 inches and weights about 1.5 pounds is expected to be available by March 2010 starting at an affordable price of $499. View the full price list of Apple iPad.